The trailer for a new documentary called California Typewriter quickly reveals that Tom Hanks is the star. Billed as "a meditation on creativity and technology," the film also features cameos from rocker John Mayer and playwright-actor Sam Shepard, fellow aficionados of predigital typing. But who are those nerds in white buttoned-up shirts and ties, banging away on vintage manual typewriters? They are, collectively, the Boston Typewriter Orchestra. And their composition "The Revolution Will Be Typewritten" is the percussive, dinging soundtrack for the trailer, shot primarily in the film's titular typewriter-repair shop in Berkeley. The doc, directed by Doug Nichol, may or may not appear at local theaters. But the BTO will have its Vermont premiere at the Burlington Book Festival on Saturday, September 17, at the University of Vermont's Dudley H. Davis Center. The performing typists are actually the opening act for public radio celebrity Martha Barnette, cohost of "A Way With Words." From his home in East Boston, which also serves as the 11-year-old group's rehearsal site, BTO member Jay O'Grady says the orchestra has wanted to tick Vermont off its performance bucket list for some time. "We think of ourselves as a New England band at this point," he says. In less than two weeks, the current six members, who range in age from thirties to fifties, will have played in all the states in the region. But don't assume they have anything to do with books. As the BTO notes on its recently updated website: "Apparently these [Burlington Book Festival] people didn't realize that we don't actually type words when we bash away at our typewriters, so don't tell 'em until afterwards and we'll see just how much fun we can have." 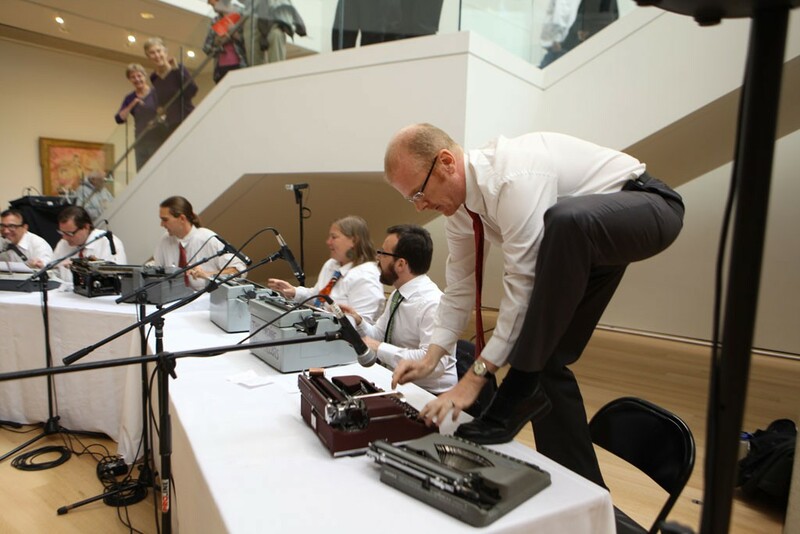 It's true: There's no paper in those typewriters when BTO performs. But the orchestra's oeuvre, now at "about 12 or 13" pieces, says O'Grady, is most definitely composed. The rhythm, syncopation and synchronization are as precise as a marching band's, and special augmentations of the machines, such as copper tubing in place of the roller bar, allow for the creation of a surprising variety of sounds. O'Grady says the members faithfully rehearse together every Wednesday night. "As with everything, the more you practice, the better you get," he observes sagely. Most of the BTO's compositions are original, with titles such as "Langston Doodle Dandy" and "Entropy Begins at the Office." But some are clever covers. As much a tongue-in-cheek manifesto as a performance piece, "The Revolution Will Be Typewritten" is a send-up of Gil Scott-Heron's "The Revolution Will Not Be Televised." Lyrics include "You will not be able to turn on, tune in and Wite-Out" and "Black and white will exist in perfect harmony on a letter-sized page." This is among the BTO pieces that incorporate spoken word. Another is titled "Harold, Step Into My Office." O'Grady likens its rhythm to "a cross between 'Stand by Me' and [Santana's] 'Oye Como Va.'"
Sometimes compositions feature actual vocals, as in "Underwood Blues," and even other instruments. A few of the members play conventional instruments and have been, or are, in bands — one currently performs in a Massachusetts metal outfit called Swarm of Eyes. In BTO, he's a Smith Corona man. "I used to DJ," offers O'Grady. His fave machine? A Remington 5. He readily concedes that a show of all clickety-clacking might try listeners' patience, like an overly long drum solo. "In performance, you couldn't have 12 songs with just typewriters," O'Grady says. "It would be too much." As interludes between songs, the players offer "banter bits." If they are anything like the "interoffice mail" that scrolls on the BTO website, expect silliness. "As part of the company sustainability initiative, all departments must switch to naturally harvested squid-ink ball-point pens," reads one. "For a good time call x3374," recommends another. And, yes, the live performances adopt an office theme, too. Which explains the shirts and ties. But this is no 9-to-5 steno pool. The orchestra's previous gigs have been both fitting and unorthodox. They've included the Massachusetts Poetry Festival in Salem, the Portland (Maine) Museum of Art — in conjunction with an exhibit called "The Art of Paper" — and the Greenville Drive-In in upstate New York, for the first annual Typewriter Arts Festival. Yep, that's a thing. As far as he knows, O'Grady says, BTO is unique, save for one copycat group in Sweden. He's not keen to see more typewriter bands in the world, but he probably doesn't have much to worry about. Learning to pound those keys just so takes a long time. Besides, vintage typewriters don't come cheap. "When we started, you could walk into a secondhand store and get one for a couple bucks," says O'Grady. "Now they've become collectibles." The original print version of this article was headlined "Keystrokes of Brilliance"